Windows' clipboard consists of a single item - press [Ctrl] + [C] or [Ctrl] + [X] again, and your original entry is lost. Thankfully this shortcoming hasn't been lost on the programming community, and a large number of tools have been developed to fill the gap. So we've scoured the web looking for 10 of the best freeware alternatives. There's a lot of crossover between the vast majority of them, so we've highlighted what makes them unique where applicable to help you pick your chosen clipboard replacement tool. This is immensely popular due to its small footprint - just 260KB without any clipboard entries in place - and simplicity. Press [Win] + [V] to select one of its entries from a simple pop-up menu - 25 are stored by default, but it can handle up to 1,024. It only handles plain text, images and file paths, but the latest beta comes with a 64-bit version and its functionality can be easily expanded with plug-ins. If you're after features over footprints, ArsClip has a vast array to tempt you. First, you can permanently store and catalogue selected clipboard entries - perfect for repetitive tasks like filling forms (helped with a form filling mode for pasting multiple entries at once). It handles a wide array of formats, including images, RichText and HTML, and doesn't require any installation. MiniCLIP works best as a floating taskbar - from here you can add items to the clipboard in the usual way, or drag and drop text from supported applications to and from the taskbar to copy and paste. 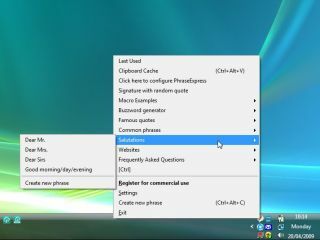 Individual entries can be edited, and files dragged and dropped on to the taskbar to add their full path name to the clipboard, but no media formats are supported. This tool is capable of storing up to 25 text snippets or images at a time, and rolling your mouse over each entry reveals a thumbnail or the text in question. It also doubles as a screen capture utility, capable of grabbing the entire screen or an active window using the [PrtScr] or [Alt] + [PrtScr] keys. This clipboard tool is for those who need to enter repetitive blocks of text. It can store entries with hotkeys or Autotext triggers, plus corrects typos as you enter them and can store formatted text (including images) as well as just the words. Need access on the move? Download and use the portable USB version. This clipboard manager's unique selling point is its support for fragments of text and graphics (referred to as "clips"), support for a wide variety of formats, and its clipboard viewing and editing facilities, which works with images as well as text. Organise favourite clips into folders and even save them as standalone files. Ditto's main unique selling point is its ability to synchronise clipboards on multiple PCs across a network (the connection is encrypted for security's sake). It also supports a wide range of formats, has a built-in thumbnail preview and comes in a portable version for USB flash drives. This tool is geared mainly towards stripping all formatting - including HTML code - from copied text, ensuring you can paste it quickly and simply into your target application. It's also a basic clipboard manager, with the ability to remember up to 10 items at a time. This tool simply monitors your clipboard, catching and saving any URLs it finds in copied text, which can subsequently be retrieved later on. This is a clipboard filtering tool that utilises PERL filters to change the nature of the clipboard selection - for example, converting everything to upper or lower case, extracting URLs and so on and so forth. It's perfect for techies who wish to analyse the clipboard's contents too.